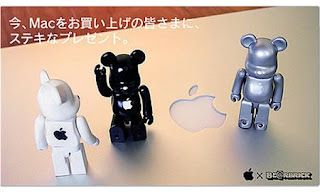 A Rinkya Blog: Apple X Be@rbricks! The Apple website in Japan is offering Apple Be@rbricks with Mac purchases! The Doggie Manicure Cleaning Set from Japan! Japanese Designers & Rolling Stones Collaborate! Pokemon Mystery Dungeon 2 Website Open! Calling All Directors for Nintendo Movie!! Rare G-Shocks Added to BuyRinkya! Security in Japan- Infrared UnderWear! Security for your Computer- Japanese Style! Blythe Exclusive Designer Charity Auctions! Romeo X Juliet Anime Online for Free Viewing! The Skeletons of Your Favorite Animes! Darth Vader Meets Samurai Warrior!